BlackBerry's "biggest, fastest and most advanced" phone is here in the form of the 5-inch BlackBerry Z30. Sashaying onto the scene with a very similar look to its stablemates, the Z30's display is a Super AMOLED one, with a Snapdragon S4 1.7GHz processor under the hood keeping things zippy. The Z30 also comes rocking the latest version of BlackBerry 10 OS, BlackBerry 10.2, and a 2880mAh battery which BlackBerry says should get you 25 hours of "mixed-use" when coupled with 10.2's "battery-enhancements". BlackBerry also reckons you'll get better signal thanks to its new Paratek Antenna, with stereo speakers boosting the handset's music playback and voice reproduction easier on the ear. "It is designed to keep you hyper connected, productive and always in control," BlackBerry's says. We're not sure how being hyper-connected is any different to just being, you know, connected but hey if you're dazzled by marketing speak then a BlackBerry Z30 may well be the phone for you. The handset is also "designed for people looking for a smartphone that excels at communications, messaging and productivity". FINALLY! A smartphone that excels at communications and messaging! Throw out the semaphore flags, Norma. We's gettin' hyper connected now. The BlackBerry Z30 release date is scheduled for next week in the UK and the Middle East, with all other regions coming before Christmas. Pricing is down to carriers so stay tuned for more on that. Meanwhile, the BlackBerry 10.2 software update should hit the BlackBerry Z10, BlackBerry Q10 and BlackBerry Q5 from mid-October, network dependent. What do we make of the Z30's smaller brother? 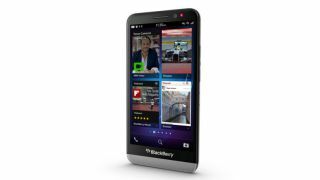 Find out in our full BlackBerry Z10 review.